I don't know about you, but one of the most difficult things for me in beading and jewelry making is simply to find wonderful stone cabochons that inspire me. If I buy them through a catalog, they don't always look like the picture, plus dozens (or even hundreds) of other people can end up using the very same cab in their piece. This isn't a problem if I'm designing a piece that I intend for someone else to make...it's actually an advantage when I'm writing up tutorials to be able to tell you exactly where I got the whatever-it-is. But when I'm designing a piece to be a one-of-a-kind, I don't want it to end up being seen around every neck in the country! My family and I all work together on producing our stones, from selection of materials to the final polish. We work with all sorts of agates, jaspers, and anything else that catches the eye. In each of our product descriptions, we include the metaphysical properties of the stone. I think these little bits can make a piece of jewelry so much more personal. Everything is currently available online and prices typically range from $16-24. So, you see that gorgeous cabochon up at the top of the post? Cabbing Rough is going to give it away to one lucky reader!! This is Kingman Turquoise, which is turquoise infused with bronze and stabilized, making it very durable for everyday wear. It is polished with diamond, and measures 30mmx24mmx4mm. You know you want it, so do this to enter for a chance to win it: visit Cabbing Rough, and leave me a comment here telling me which other cab is your favorite (personally, I'm a sucker for Chryscolla). If you tweet or post on Facebook or other social spots about the contest, you can leave a second comment and be entered twice! Deadline: August 4, 2010. Gorgeous. And thanks for the link to the seller. So far I like all the ones that say Reserved - especially the landscape Jasper. The gold labradorite is pretty too... But I think I'm picking the Sonoran Sunset Chryscolla as my favorite. I love the Regency Rose Plume Agate ... it's such a subtle, pretty cab! I've already retweeted this contest, so does that mean I get to enter twice? Please enter me - that cab is gorgeous! I am also going to post this giveaway on facebook and my blog - thank you! I love the Sonoran sunset!!! OMG thank you so much for referring us to Cabbing Rough. I have been searching and searching for some unusual cabs. So many of them are just the same-o same-o. But these are awesome! I ordered several and entered into the give-away as well. Good blog, I subscribed to you too. Thanks for the link to the shop. I see its new. I buy a lot of my cabs on Etsy so I'll be glad to heart them and check them out better when I can. That Turquoise is SO yummy!!! I also LOVE the Azurite from your shop but I am also a sucker for blues!! Ok, do I get a second entry? I just shared this on FB! The color is just spectacular! Oh my. That Sonoran Sunset Chryscolla is amazing. However I am a sucker for the Labrasorite. Love it!!! In fact, I may just buy it. Thank You for introducing us to this great source of cabs. I couldn't decide between the Graveyard Point Plume Agate on page 1 or the Handcut Oval Porcelain Jasper on Page 9. So many to choose from, so little time. I added them to my favorites so I can buy from them in the future. Just put you on my facebook page and my blog sidebar (under Give-Aways). Hope it brings Cabbing Rough some more business. Holy Toledo...those dry head agates are wonderful! But you are so right...the turquoise with the bronze is just stunning. I'm bookmarking this Etsy treasure shop for sure. Love the Ocean Jasper Hand Cut Cabochon! The colors create so many possibilities! Gorgeous stuff!!! The Dentridic Soapstone is my second favorite, in a tie with the Labradorite. The Turquoise with bronze is my #1. Love it! This is beautiful! Will check out more from these folks. I love them all but the Dryhead Agate and the TeePee Canyon Agate are my favorites. I've blogged about it at hispirations-jewelry.blogspot.com. What an opportunity! I love, love, love the turquoise. My other favorite would be the Blue Cal Silica, but there are many others on your site I like very much, also. I took a class in creating cabochons, and if I could afford the equipment I might be making some of my own. Yours are all very well formed and lovely. I've bookmarked your Etsy page and will be back with some money soon. I'm another sucker for the Regency Rose Plume! Gorgeous stuff...I love them all, actually. I adore the Hand-cut Lapiz Lazuli. Oooooh this is a gorgeous stone. I think the prettiest but my choice for second place would be the Imperial Jasper. Thanks for sharing this site as I am incorporating more cabs in my silver jewelry and just bought a book on wirework and would like to try that with the stones as well. I adore the labradorite, and how the polish makes the schiller so bright and noticeable! 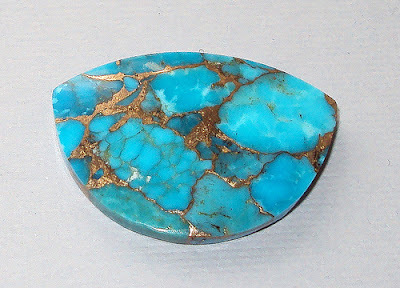 I have never seen a turquoise cab like that, and would like to pair it with crazy blue lace agate beads. Please enter me in the contest! I posted to facebook, and on my gmail page. On second thought, I might have to switch favorites to the teardrop porcelain jasper cabochon--it reminds me of geisha houses and tea ceremonies. I love the colors in this stone and I have to agree with many of the other posters that the Sonoran Sunset Chryscolla is fabulous. I'm drooling over the giveaway cab - what great veining! My heart skips a beat over the labradorite...it reminds me of the ocean. Since we moved to the Southwest desert in AZ from the East coast, I've been homesick for the ocean. Many thanks for the link & giveaway info. oh man the ocean jasper is my kind o' cab! All so beautiful, I tend to go for the pinky red warm colours so Rhodochrosite, Pink opal, Flame Quartz, Regency Rose Plume Agate, but I also love the Malachite, hard to get it down to just the 'one'. I saw the giveaway and thought of my daughter, always tend to go for Turquoise and said colours when I think of making something for her. Will now nip over to facebook. Thank you. The turquoise bronze cab in fabulous. It feels like water and sand to me, or sky and canyons, but it definitely is a stone that reflects nature. Wow, beautiful stones! I love the pinkish Ocean Jasper teardrop that's got the big dark spot! Will definitely bookmark this shop. Oh and I'm a first time visitor to Beading Arts too - you're getting bookmarked as well! wow! amazing cabs! right on the first page i love the coyamito and then after that the blue cal silica. i would so love to win this cab! keeping my fingers crossed. also put this store in my favs so i can keep going back. thanks for telling about them! My favorite is an ocean jasper cab that display both the characteristic of a fine ocean jasper specimen and the translucent quality of an agate. My second favorite cab is an oval turquoise. I love how the copper is shining through it. Turquoise is my favorite, and American Turquoise I hold dear. What a gorgeous cab. Thank you for the giveaway, I hope I am lucky! My second best would be boulder Opal. I posted about your giveaway on my blog and now I am back to tell you about it. Also the first time around I did not realize you meant choose a favorite from Cabbing Rough, so I checked them out and my second favorite would be the Arroyo Picture Jasper cab. Thanks again. I'm a huge sucker for any kind of jasper, but the landscape jasper pieces really caught my eye! Gorgeous! Thanks for sharing the supplier - I struggle for great stones too! I have to say I loved the Arroyo Picture Jasper Hand Cut Cabochon - it is very subtle but looks just like a landscape! Fab! Please enter me in the giveaway. What a gorgeous piece! Thanks for doing this. I've been hooked on Jasper this season. What a great giveaway. Thanks for the link to the seller. There is a wonderful cab there - Coyamito Agate Hand Cut Cabochon. I also wante to tell you that I have posted in Facebook! I like the Labrodorite, as all blue/greens appeal to me. Thanks for entering me in the giveaway. I have so many favorite stones and beads but I must say I am especially partial to turquoise since it is my birthstone. This is a lovely stone with great shape and dazzle. I am such a big fan of Turquoise and your Turquoise Giveaway Cab is just fabulous!!! I'm, also, loving the Chryscolla Hand Cut Cabochon and then the Wild Horse Picture Jasper Hand Cut Cabochon is gorgeous, too!!! All your stones are beautiful!!! The turquoise piece you are offering is a beautiful, unique piece that can be worn all year 'round, dressed up or dressed down with jeans, how great is that! It's your "go-to" piece. I'd love to work with it! OMGosh I love them all! I would have to say the Mooka Jasper speaks to me though. Labradorite is my favorite, right after turquoise. And the cab is awesome! What a chance to win this. And here's the link to my facebook post. The turquoise prize is exquisite. I checked out the site and was blown away by the GORGEOUS labradorite and mooakite cabs, but my favourite listed is the Hand Cut Designer Laguna Lace Agate Cabochon with eye - what a beauty!!! I posted again on facebook. The Birds Eye Rhyolite is so fanciful! I like the crazy blue lace agate.Sometimes it's absolutely awesome!I have also put this giveaway on Facebook,though to tell the truth,I've never won anything,I hope to win this or the lottery.Either will make me happy! The serafinite is gorgeous. That's my choice. Really loving the Rhodocrosite hand cut with the beautiful pink "waves" in it. I linked to Facebook, so I'm leaving another comment. I must say I like this seller's interesting shapes of cabochons -- they aren't all the same! some many pretty items but I like the Kingman piece the best. the infused bronze gives it an oriental quality that would be nicely accented by Cinnabar or dark Coral. Cyndi, the Cabs on the link are fabulous! I had to look at them all. I'm a sucker for the Labradorite and the beautiful fire Agate. They are all wonderful. Thanks for sharing. I love the "Sleeping Beauty" turquoise cab next best on your etsy page! Thanks for adding me to your drawing here on the last day of the giveaway! I too am a big fan of chryscolla but the one that caught my eye is the Jafar Jasper Hand Cut Cabochon http://www.etsy.com/listing/52286901/jafar-jasper-hand-cut-cabochon . I love the high contrast and the little bits of sparkle. the seraphinite tear drop is amazing! and the rainbow cal-silica: all the colors! What a great store, I'm definately adding it to my favorites list on etsy! Thank you for the chance at this giveaway! I've got my eye on Cherry Creek Jasper. Thanks for letting me know about this Etsy shop. I'm bookmarking it for when I've got money left over after paying the monthly bills.